The African Great Rift Valley - The Maasai Mara is part of the Tentative list of Kenya in order to qualify for inclusion in the World Heritage List. My first visit to Kenya was in August 1999. I started that trip in Nairobi, where I stayed at the Norfolk Hotel, the most historic hotel in the capital. From Nairobi I flew to the Masai Mara Game Reserve, the northern continuation of the Serengeti National Park in Tanzania (which I visited later on the same trip), and stayed at the Mara Serena Safari Lodge, in the heart of the Mara Triangle. 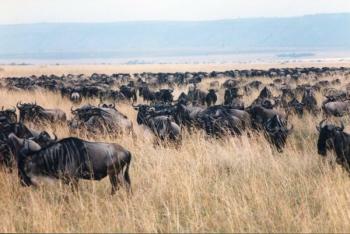 I have been on safari in most of the major national parks throughout Africa, and the Serengeti/Masai Mara ecosystem is, by far, the best; which side is better (the Serengeti or the Masai Mara) depends on the month of visit, and in August, the height of the wildebeest migration is in the Masai Mara. Due to the abundance of ungulates, it was easy to locate predators, like spotted hyenas, lions, cheetahs and jackals, as well as their prey, like Thomson's and Grant's gazelles, topi, wildebeest, impala, African buffalo, common zebra, and waterbuck, as well as Masai giraffe, hippopotamus, and African elephant.